Congratulation to DA Red for their third place finish at the McGregor Cup in Richmond Hill. After a slow start to the day, losing three of their first four matches, the team came to life and started making plays. The girls began moving their feet and getting more involved in the play. They won a number of hard fought series and advanced to the semi-finals. After a close loss in the semis, they proceeded to the bronze medal games. It was nice to see all the team members involved in both the victories that secured the bronze (2-1). The games were exciting and a lot of fun to watch. the girls continue to improve as the season goes along. 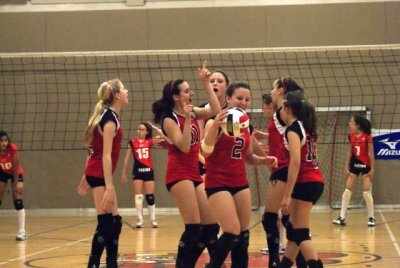 The girls and parents endured a 12 hour day competing in the DRVC Tournament in Whitby. They finished fourth. Game One was a 2-0 (25-14, 25-17) vistory over Leaside. Game Two was an 0-2 loss to the Eclipse (11-25, 18-25). 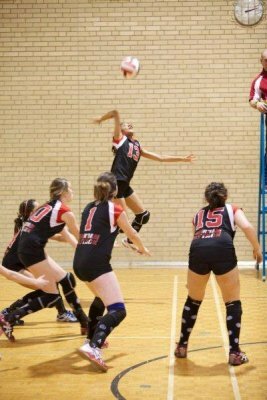 Third game was a 2-0 victory over Peterborough (25-18, 25-17). The final game was a 1-1 draw with the Predators (25-23, 18-25). 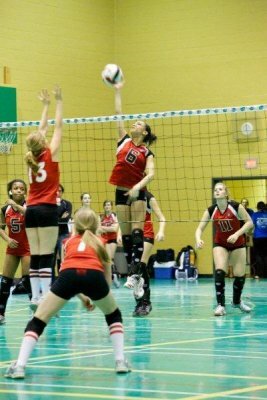 In the play-off s they won 2-0 over the second Leaside team (25-23, 27-25), before being humbled by the Eclipse 2-0. They also lost their consolation match. The games were exciting and it was a real learning experience for the girls dealing with a long day. Coach Richardson did a great job keeping the girls motivated in the absence of Coach Allin. The day also featured the coaching debut of Coach Gianatselis. He did a great job in a subbing role. On December 12 the team will be visiting the Stewart Group Home in Pickering to deliver gifts and sing some Christmas carols. Thanks to Coach Richardson for the sleepover and arranging the visit. Excellent start to the season for the U15 Red Team as they won silver in their first tournament of the year. After a lot of practice and fitness training the girls were eager to test their skills. 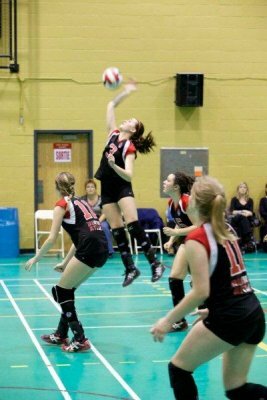 There are many first year OVA players on the team, so everyone was curious to see how the team would come together. Next they battled the Mavericks. Theyagain won 2-0 (25-12, 25-16) These games featured a lot of back and forth action. Next up were the Peterborough Thunder. DA won 2-0 (25-16, 25-20). The competition was getting stiffer and the games more exciting. The semis were an all Durham affair withthe Reds battling DA U14. Again the Red prevailed 2-0 (25-21, 25-23) . These games were very exciting and featured some great play by both squads. In the finals the Red came up against an experienced Ottawa Fusion team. In a back and forth first game the Red prevailed 25-22. Ottawa battled back winning the second game 25-14. This set up a very excitng final game. The Red were down 9-13 and surged back to tie the score 14-14. Then, despite an inspiring “sitting” River Dance by parents – the team fell by a final score of 16-14. A great day was had by all. Team manager Bev and the parents organized great meals for everyone. Credit goes out to coaches Mel and Mike for doing a great job preparing the team for the tournament and skillfully managing the games. There were a lot of nervous girls at the beginning of the day – but they really came together as a team to play some outstanding volleyball. May 24, 2010; Calgary Alberta. The final tournament of the 2010 season saw DA 16U Girls Black finish 5th at the West Nationals that included 112 16U Teams. Playing against the top tier 1 teams in the Nation, the girls earned a position in the final 8 and quarter finals for day 3 of the West Nationals. DA Girls 16U Black played with all the skill and determination they could against the undefeated Dinos of Calgary, who eventually won the Gold Medal. A three set match win against our girls in the quarters looked more like the Gold Medal match with the Dinos losing their only set of the tournament to our team. A season that started 9 months ago and earning 3 Bronze Medals including one at the 17U Provincials, 1 Silver and 4 Gold Medals including the Gold at the East Nationals was an outstanding result for the Team and Coaches! We are proud of the results of the season and congratulate all the coaches, girls and parents for the hard work and support over the year. Thanks to John Dean, Mike Slean and Kevin Hellyer, who volunteered their time to the Team to help them learn and play their best. 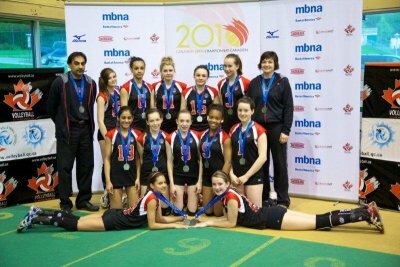 Girls 14U Team Arif Caps off Incredible Season with Silver at Nationals! Jun 7, 2010. 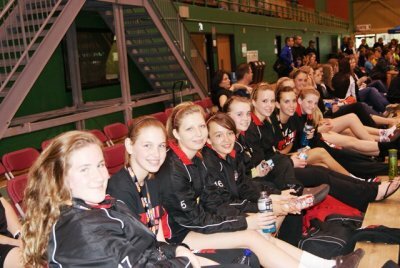 Team Arif wrapped up a truly amazing season finishing second at the Nationals East in Sherbrooke, Quebec. The team captured a total of 10 medal wins in both 14U and 15U tournaments; 5 Gold, 4 Silver and 1 Bronze, among them a Provincials Gold title and National’s East Silver! 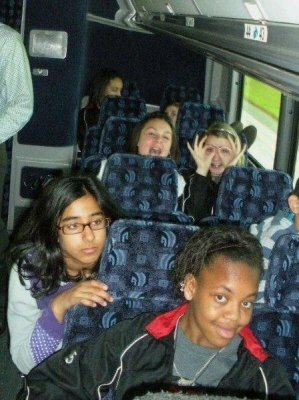 In true team style, the 14U girls, Coaches Arif and Vicki and a throng of parent and sibling fans, boarded a chartered coach for the journey to Sherbrooke, Quebec and 4 days of fun, volleyball and camaraderie. Coming off 2 stellar performances at the 14 and 15U provincials, the energy on the bus was like static electricity in the air. The ride afforded the entire ‘team’ some down time together, without the pressures of performing, time to enjoy friendships old and new, and time to reminisce about ”the best season ever’! A few movies and alot of laughs later, a weary Team Arif settled in at a lovely resort, nestled between the mountains and a lake, for some much needed sleep. Day 1: Our first match is against MAC from Hamilton. The Attack girls fire off some quick assaults taking an early lead to win both sets 25-12 and 25-22. Attack takes the second match against the Royal City club from Guelph in straight sets, 25-4, 25-16. 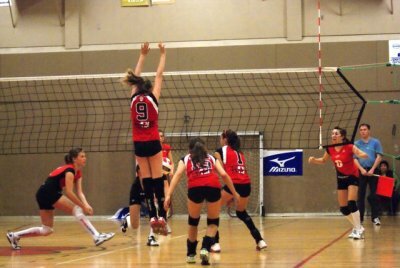 In our third match of the day we meet Envolley from Sherbrooke, our host club. Despite some sloppy play early in game 1, Team Arif steps up their game and takes command of the court, propelling themselves to another decisive win, 25-13 and 25-6. Day 2: Our first match of the day sees us meet Lynx, from Quebec, a strong club that appear to have the skill to keep up with our Durham team. Some exciting play serves up a 25-13 win for Team Arif in game 1. In game 2, the fans witness both clubs pound out point for point, Team Arif manages some breathing room by skipping ahead 12-8, but the Lynx manage to claw back and after some long rallies and inspired play, Lynx takes game 2 25-22, handing Durham its first loss of the tournament. In the tiebreaker the Durham girls are slow to react and fall behind quickly down 2-5, digging deep and pressing forward, Attack manages a 5-5 tie, then an 8-8 tie and keep up with the Lynx. With the Attacks pace slowing the strong Lynx team manages to take game 3, 15-13. The second match of the day finds us face-off against the Waterloo Tigers. Our Attack girls serve up some solid play against this tall Waterloo team and finish even stronger with a 25-9 win in game 1 and despite, offering up many opportunities for the Tigers to take control of the game, the Attack eventually takes game 2, 25-20. Our third match is against Aigles du College-Jean-Eudes from Montreal. After a stupendous start, Attack finds their groove and accelerate to a 25-10 win, capitalized by a sizzling spike for the game point! Exuding confidence, Team Arif explodes to a 10-4 lead and never looks back, winning the final point with an admirable block at the net, 25-13. Day 3: Mother’s Day begins with snow flurries and a lovely surprise as the girls present their moms with a giant Mother’s Day banner and mini-volleyballs, both with personalized messages! Who could ask for more! The quarter finals begin with Team Arif meeting Oakville Thunder. Attack come out swinging and while Thunder tries to keep pace they are unable to; Attack takes the game 1, 25-15. Game 2 begins with some intelligent play, Attack’s strategic ball placement pushes them ahead but they are soon caught napping and Oakville takes game 2, 25-23, forcing a tie-breaker. Game 3, a close game with each team advancing point for point, and a 5-5 tie, team Arif kicks it up a notch and the score is 10-9 Arif, then 12-12. After a timeout, Team Arif continues to apply pressure and eventually wins a huge nail-biter tie-breaker, 16-14! In the semi-finals, Attack meets the Celtique from Montreal, an agile team with surprising speed. Attack takes things in stride and continue with their game plan, taking the Celtique in straight sets, 25-19 and 25-12. Gold Medal Match against the Scarborough Titans Synergy. Having defeated this team at the Provincials the girls know the Titans to be a strong team- this, combined with a few ill or injured Attack players, would undoubtedly make for a tough match. Unable to find their warrior spirit and muster up a significant offence, Attack fall in game 1, losing 20-25. Game 2 sees the fans getting restless at the dodgy officiating; the girls appear out of sorts and it shows in their awkward play. Despite a valiant effort and a hard fought battle, it is not meant to be on this day, and Team Arif takes home a Silver at Nationals. Wow, what a tournament – a tremendous effort by the whole team as Durham Attack Girls 14U Team Arif places second at the Nationals. 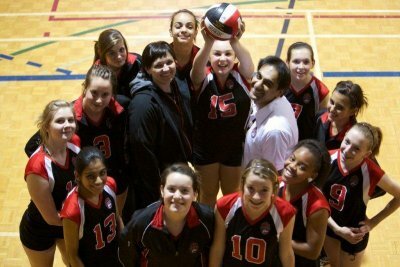 Well done ladies – awesome job Coach Arif and Coach Vicki! And so the indoor season wraps up for Team Arif – a season we will never forget – 10 medals; a Provincial Gold and a Nationals Silver, 12 amazing young ladies, 2 unparralleled coaches, 1 super parent rep, a dozen supportive families and a million fond memories … priceless! U14 Chris headed to Sherbrooke on May 6th to play in the National East event. The girls were very excited to be going away as a team one final time this year. We played in a tough opening pool on Friday, finishing third, which placed us in division three. After a slow start on day one, Attack came out with some renewed energy on Saturday and went 3-0. On Sunday, we defeated Daibols from Trois Rivieres and Waterloo to get to our pool finals. We faced Ottawa Fushion in a very exciting match. Attack took game one 25-20, with Ottawa winning game two 23-25. Attack came up just short in the deciding game 15-17. 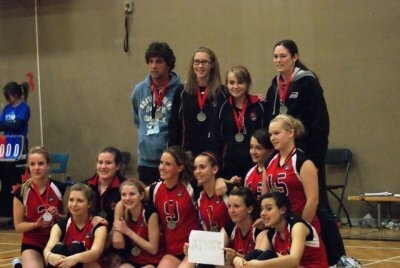 Congratulations girls on winning silver in your pool! Girls, we’ve had a fun year and you played well. A gold in Rochester, two bronze in OVA events and a year-ending silver. We have all made new friends. In fact, the coach from Toronto West recently sent an email to our club President highlighting the sportsmanship that both teams displayed in Sherbrooke, as we cheered each other to victory. You should be proud of your accomplishments. To our parent rep Lyla, thank you everything. You have put in countless hours towards this team and we are grateful. To Chris, Melanie, Darik and Jacek you have provided a wonderful learning environment for the girls. We cannot thank you enough for your tremendous commitment to this team. 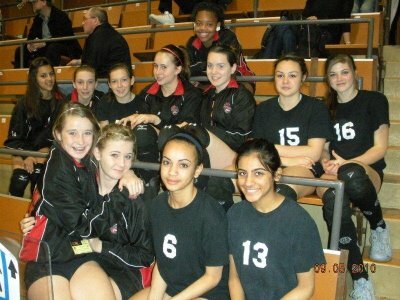 They have developed as volleyball players and as young ladies. Thank you to the parents. We hosted a great tournament in Whitby and we all contributed to the team in some way. See you all at the beach. 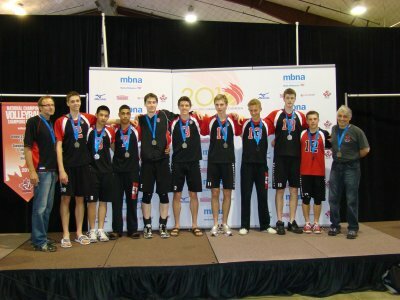 Capping a successful season where they never finished lower than the bronze medal position, the U17 boys became the only Ontario male team in this age group to medal in both provincials and nationals, following up their bronze at Provincials with a silver at Nationals this past weekend in Abbotsford, B.C. The members of the team who travelled to Abbotsford were Spencer Baron, Alex Beckford, Jonny Brouse, Alex Dawson, Alex Elliott, Trevor Grant, Chris Lam and Rob Wojcik, plus Jayson McCarthy from the U16 team. Dogged by physical misfortune, as 3 team members suffered sickness (apparently food poisoning), one player had a re-occurrence of a pre-existing knee injury and another dislocated a finger in the semi-final game, the team remained focused throughout. It was a real team effort across the 3 days of the tournament, with each of the players stepping up with important contributions. The team scored points with a scrambling defence, solid passing, key blocks and powerful hitting across the entire front line. The boys started the Tier 1 quarter final on Sunday with a win over a heavily favoured Manitoba 204 squad (the Provincial Champions), followed by a semi-final victory over the Ontario Champs Waterloo Tigers. In the final against their arch-rivals Crush, the battle of attrition finally took its toll and after splitting two games, the boys lost the tie breaker. Although each of the boys made any number of all-star plays, Rob Wojcik and Alex Elliott were the recipients of well-deserved official all-star recognition. The team wants to thank their coaches, Marius Wojcik and Lawrence Flynn for all their support and mentorship at the tournament plus all season long.